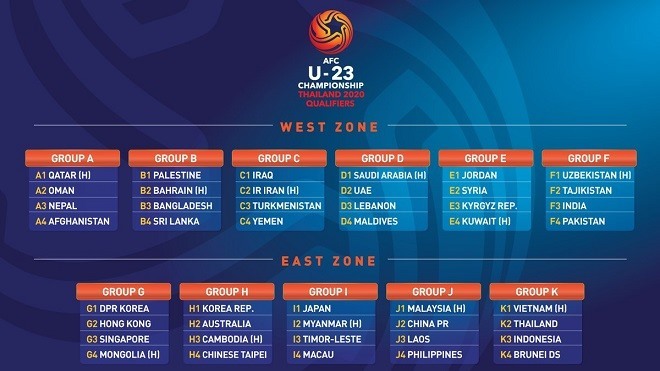 HÀ NỘI — Việt Nam are in Group K of the AFC U23 Championship Thailand 2020 qualifiers, following the official drawing at the AFC House on Wednesday in Kuala Lumpur. Việt Nam, who finished runners up in the 2018 edition of the international football tournament, will be joined in the group by Thailand, Indonesia and Brunei Darussalam. The qualifiers divided the 44 participating teams into two zones: West (west, south and central) with 24 teams and East (east and ASEAN) with 20 teams. In the event that the pre-qualified host of the finals, Thailand, finishes in the qualifying spots, the next-placed team in the combined ranking of all the groups will qualify for the finals in their place.